For avoiding any types of chaos and irregularity in TGT / PGT exam uttar pradesh state government of uttar Pradesh had given a strict instruction to up sessb (senior secondary education Service Selection board). According to some credible source, just like UP TET examination 2013 district administration will be very strict on UP TGT PGT Examination. Question Paper will be also set of high level of stander just like up tet. All these precaution have been taken by government for preventing the copying problem in TGT/PGT examination. Roll no for various candidates will be also allotted after mixing and it will be randomly alloted in admit card. Recently UPPSC also adopted this scheme to allot roll no randomly for applicants of the examinations. Strict inspection will be done on each center by uttar pradesh madhymik shiksha seva chayan board. Mostly candidates now days filling application form in a series in various examination that’s why they gets same examination center and they solved question paper by helping each other. Upsessb had taken action on such type of complaint. This time roll no will be allotted after mixing for various subjects. Carbon copy of OMR sheet will be also distributed to each candidate. Answer key / answer sheet of all Subjects and all booklet code will be publish on same day here. Up Secondary education service selection board will held a written examination for trend graduate Teacher / post graduate teachers. 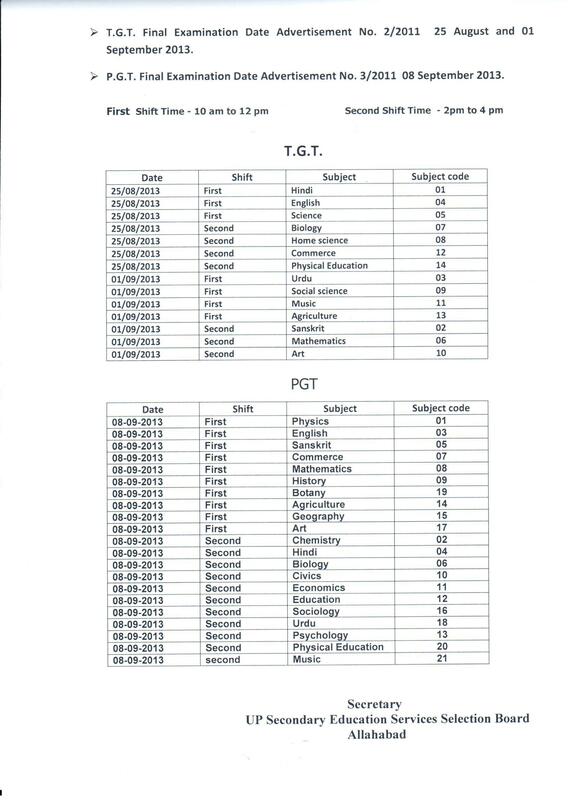 Exam dates of UP TGT are 25 Augusts 2013 and 8 September 2013 for various subjects.